The Rams have quickly built a perennial contender thanks to an explosive, well-rounded offense and a defense that can both make big plays and be plagued by inconsistency. If they’re going to get better in 2019, several areas of the defense will have to be addressed around Aaron Donald. Here’s what you need to know about the Los Angeles Rams and the 2019 NFL Draft. The Rams already spent two of their first three picks upgrading the defense, sending their second-rounder to the Chiefs as part of the Marcus Peters deal and their third-rounder to the Jaguars in the Dante Fowler deal. The seventh-rounder is also missing as a result of packaging it with Alec Ogletree in a trade with the Giants. The Rams brought in Dante Fowler to help paper over their issues at edge rusher, but he’s heading into free agency and the team must find an impact player to start opposite Samson Ebukam. Lamarcus Joyner is also a free agent, so the Rams must either bring him back or find someone else to start at free safety. Mark Barron’s price tag has outpaced his production, and even if he’s retained, another quality starter is needed inside at linebacker. 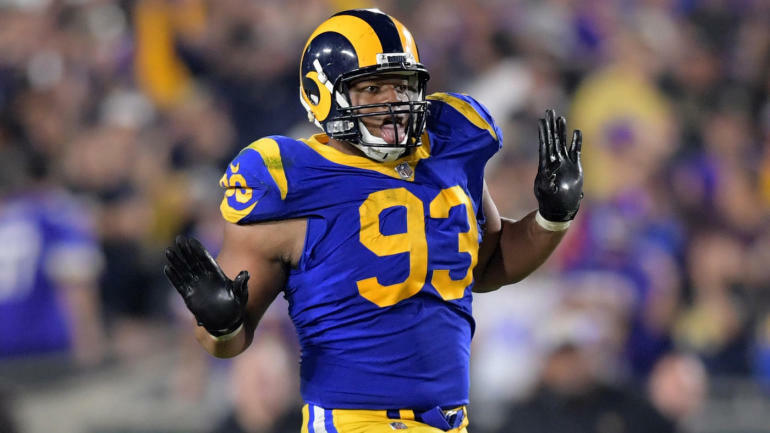 Ndamukong Suh was signed to just a one-year deal, so he’ll either have to be retained or the Rams will need to find a third starter on the line next to Aaron Donald and Michael Brockers. The Rams already cut bait with Jamon Brown and will now see Rodger Saffold enter free agency, making guard the one spot on offense that must be addressed with starting-caliber players this offseason. Ximines is easily one of the most polished pass-rushers in the class, with a dizzying array of maneuvers to beat offensive linemen at the point of attack and the ever-important ability to convert speed to power on his bull rush. He’d be an ideal stand-up outside linebacker in Wade Phillips’ scheme. A former cornerback, Thornhill made a smooth transition to safety in 2018 and reeled in six interceptions after making four picks in 2017. At 6-foot and slightly above 210 pounds, he checks the measureables box and is a fluid athlete capable of quickly changing directions and exploding to the football. Clearly, Thornhill has above-average ball skills too. To some, Burr-Kirven will be undersized at 6-foot and around 225 pounds. But he’s lightning quick, has rapid play-recognition ability, is a mature block-shedder, and can make plays in coverage because of his movement capabilities. He’d be a fun, athletic fit behind Los Angeles’ stellar defensive line.